’TIS THE season to be jolly. Unless you’re Megan Reid and you’re just not feeling it. No matter how many decorations, Christmas jumpers and festive movies your big sister Rosie throws at you, you’d sooner be snuggled up on the couch, keeping it mellow. 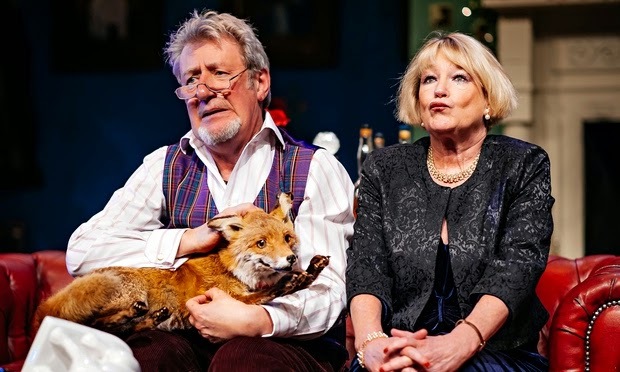 As far as plot goes, that’s about the limit of this two-hander by Glas(s) Performance, but that doesn’t stop it being a warming mince pie of a show, quietly digging into an ordinary family history to bring to the surface the bonds that hold us together. Inside this everyday relationship, they find something uplifting, tear-jerking and true. Megan and Rosie are real-life sisters, graduates of the superb Junction 25 youth theatre run by directors Jess Thorpe and Tashi Gore. Megan is 22 and Rosie one year and two days older. Those two days, she insists, are important, which gives an idea of the quarrelsome territory we are in. A kind of lopsided cabaret, Glimmer is powered by Rosie’s ebullience and disrupted by Megan’s laidback indifference. Even when persuaded to pick up her guitar, Megan offers only half-tempo indie-folk renditions of Christmas favourites, sweet-voiced but morose. Her downbeat vibe almost – but only almost – brings Rosie’s puppy-dog bouncing to a halt. After 22 years together, they have been here before and will be again. But, just as neither has shaken off the squabbles of their childhood, neither has let go of the shared experience, the kinship and all those Christmases together. However mismatched they may seem physically and temperamentally, they have a relationship closer than any other. Just look at the gorgeous sequence where they watch It’s a Wonderful Life in positions more intimate than even lovers would adopt. There is cruelty to come but beyond it a reconciliation rich in seasonal sentiment. It’s beginning to look a lot like Christmas. YOU KNOW know when you’re given a Christmas present, and you smile gratefully even though it’s misshapen, not to your taste and you’re not sure what it actually is? That’s what Orla O’Loughlin’s production of this comedy by Iain Finlay Macleod is like. The Devil Masters seems well intentioned, but it is hard to know what to do with it. The scene is in an Edinburgh New Town living room – realised in stiflingly naturalistic detail by Anthony Lamble – where the Christmas Eve preparations of two dog-loving advocates are interrupted by an intruder with designs on their Skye terrier. One kidnap, attempted robbery and assault later, the tables are turned and the lawyers take charge. By the end, the tables have turned twice more. It is not that Macleod is short of ideas. Has he written a class-conscious subversion of the drawing-room comedy? A Tarantino-esque vision of dog-eat-dog status games? A commentary on the slippery surfaces of language and identity, like his own excellent Somersaults? A tribute to the surrealism of Edward Albee’s Seascape? A Jekyll-and-Hyde satire on the division between Edinburgh’s haves and have-nots? A howl of outrage at the power accorded to the legal profession? A spiritual condemnation of those who replace family values with self-interest? The Devil Masters is partly all of these things, but not fully any of them. It’s like watching the rough drafts of several plays at once. Sometimes one of them flashes into focus, and you find yourself laughing at some wordplay or gripped by a legal debate, but a moment later, you’re watching another play altogether. Keith Fleming does a great job as the amorphous outsider who is psychopathic one minute and vulnerable the next, while John Bett and Barbara Rafferty play up the contradictions of the homeowners. But they are stuck in an overwrought production of curate’s egg of a play. YOU could mistake Cliff Burnett's Scrooge for a genial fellow. He's much given to chuckling and seems content with his place in the world. True, he resents his staff taking a day off for Christmas and delights in poking a carol singer in the eyes, but his complaints are less the view of a misanthrope than the expression of a reasoned political philosophy. His laughter is more complacent than cruel. But in Dominic Hill's gloriously spooky production, played out in monochrome on Rachael Canning's set, Burnett's air of satisfaction becomes less secure. As the supernatural visitations enter his bedroom, his laugh becomes a nervous tick, an expression of doubt instead of certainty. With his red nose, white face and swept-back silvery hair, he is no pantomime baddie, but a misguided man whose worldview is genuinely rattled. And who wouldn't be rattled by Canning's puppets? 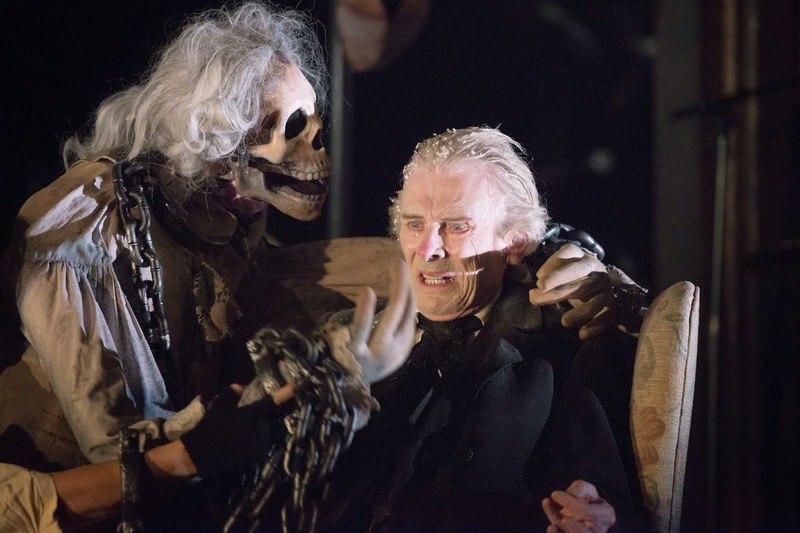 The ghost of Jacob Marley is a grinning skull with a grey wig and a torso draped in chains. The Ghost of Christmas Past has the body of a child and the blank-eyed face of a table lamp. At one point, sheets of ectoplasm waft through the auditorium. Only with the fortification of the interval can we cope with the vulture-like Ghost of Christmas Future, a looming giant decked in tattered strips of black material. With the dissonant scrapes of Nikola Kodjabashia's live score falling into line with the poetic rhythms of Neil Bartlett's script, it's a dark and austere production that focuses on Scrooge's journey to self-realisation and goes sparingly on the "we was poor, but we was honest" sentimentality of the story. 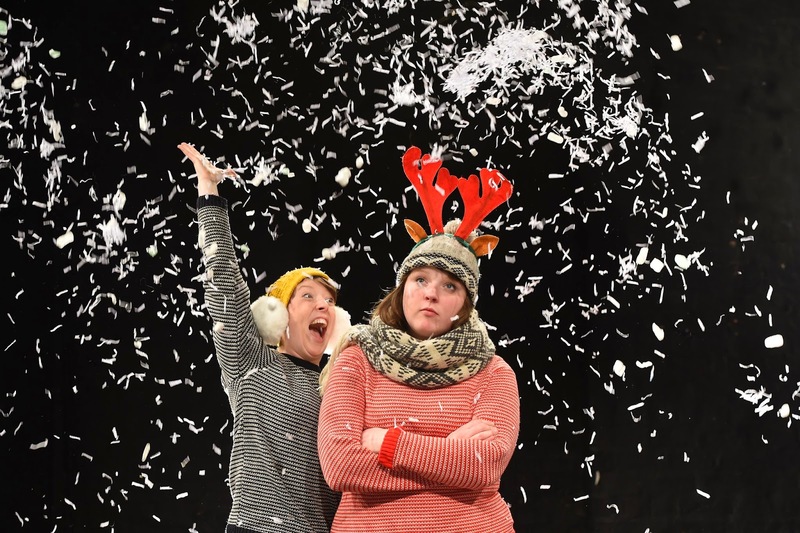 There is also joy in the creativity of the staging: the way the actors throw snow over themselves before coming on and rework Christmas carols to poke fun at Scrooge. It all makes for a rich and satisfying seasonal treat. IT'S a formula with a proven track record. Last year's Limbo, the Australian centrepiece of Edinburgh's Christmas programme, which also enjoyed long runs in London, showed what could happen when you combined a crack team of musicians with a handful of skilled acrobats and framed them with a grungy cabaret aesthetic in the Paradiso Spiegeltent. 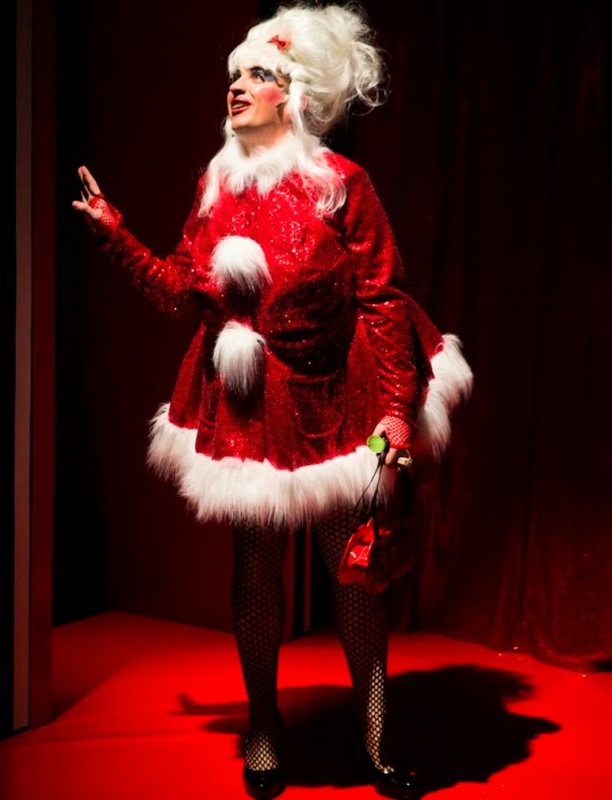 Presented by the Underbelly and Company 2, Scotch and Soda ticks the same boxes, and has musicality enough to keep a festive audience diverted for 60 minutes, but it is no match for Limbo's sassiness, imagination and jeopardy. The setting is an Austrian bar room where men in Tyrolean hats, braces and calf-length lederhosen play cards over a rough wooden table or knock the dust off ancient-looking suitcases. Ben Walsh's score for the Crusty Suitcase Band has an appropriately Germanic feel, expanding from a jaunty oompah two-step to old-time jazz and swing, with a brief diversion into a rumbling dub deconstruction to add an other-worldly touch to a solo trapeze routine. Always on the move, the musicians give Scotch and Soda its character and shape, but they also make the circus tricks look like an afterthought. The show has its moments, such as the construction of an Empire State Building of packing cases or the long-bearded Mozes supporting his body by the nape of his neck, but they come in between a surfeit of routine tumbling, underwhelming handstands and sketches that come to nothing. Even the show's one novelty, an act involving three budgies hopping on and off a music stand, has an air of uncertainty. That one is performed by co-director Chelsea McGuffin who is weirdly the show's only woman. I'd like to complain about the nine-to-one gender imbalance, but prefer to imagine the women have chosen wisely and somewhere a spirited all-female cast is performing a smarter, riskier, more awe-inspiring show. IT'S 1996 and, as the Edinburgh Fringe kicks off, there's concern at the Assembly Rooms about one of this year's big shows. It's a clown piece from Russia and, although it has already won a Time Out Award in London, nobody in Scotland knows what something with the mysterious name of Slava's Snowshow could be. Business at the box office is perilously sluggish. The marketing department takes emergency action. Publicist Liz Smith has already seen the show in London and knows it has the potential to be a very big hit. "I thought it was the most incredible thing I'd ever seen," she says today. "But then in the first week it came to Assembly, it hadn't sold and it wasn't being talked about." Setting out on a mission to make sure it was talked about, she started giving tickets away in the belief that word-of-mouth would do the rest. The plan worked. "We absolutely papered it for the first four or five days and then the following week you couldn't get a ticket," she recalls. "I remember people coming up to me and saying they'd like a ticket and I'd say, 'I'm really sorry, you can't get it now.'" It was the only show on that year's Fringe that created a real buzz and it was a crucial step in Snowshow's road to global success. Two years later, it won the Olivier Award for Best Entertainment after its run at London's Old Vic and it has now been seen by more than 3 million spectators in 120 cities in 30 countries. In Russia, they've published a book called The Philosophy of Snowshow, with an English translation due out next year. Still going strong after more than 4000 performances, it is back at Edinburgh Festival Theatre after its last sell-out run in 2011. 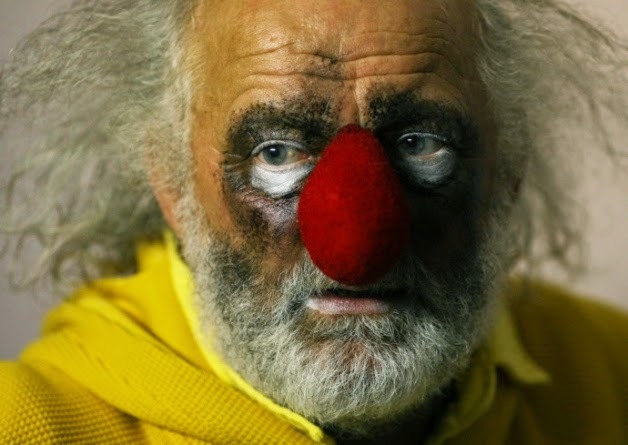 For chief clown Slava Polunin himself, it'll be a delight to be back in a city that holds such happy memories. "The British people just opened the doors to this show," he says. "Edinburgh is a great festival. It's such a happiness and joy to be there. You can be there with or without a show, just being there, hanging around – it's such a specific atmosphere when the whole town is living the same event. I'm dreaming about going there again." A world away from the knockabout pratfalls of the big top, Snowshow is poetic and poignant, a performance that turns the popular spectacle of clowning into a high art of visual grace. Full of magical transformations, it blends slapstick with beautiful imagery, gradually building towards the triumphant closing sequence in which Slava rips up a love letter only to watch it turn into a blizzard of snowflakes. The joy is infectious and, indeed, connecting to the audience is something he can't avoid. "We have no choice because the people who are on the stage are in society, they are living life with people," he says. "They can't just be on stage and demonstrate something. What they need is to party and to be happy together with other people, with the audience." Born in 1950 in small-town Novosil, 225 miles south of Moscow, Slava had an early love of Charlie Chaplin and Marcel Marceau which developed into a full-blown obsession with clowning. After training in St Petersburg, he honed his skills in mime, street theatre and visual comedy, setting up his first company, Litsedei, in 1979. He learnt not only from silent cinema but also from the silence of the great mime artists on stage. "The silence of Marceau was a great silence, a cosmic, magic silence," says Slava, who is also artistic director of the St Petersburg Circus. "I've also seen wonderful silence in the early shows of Jean-Louis Barraut [the French actor, director and mime artist]. It inspired me so much. I consider the greatest show on stage to be a silent one. Charlie Chaplin used music so it wasn't complete silence, but as a teacher, a master, he has a very important place for me. I love Chaplin's contemporary, Harry Langdon, even more. Langdon was much more fine tuned, much more tender, so I love him more than Chaplain." Inheriting a tradition that extends all the way back to the theatre of ancient Greece and Rome, Slava practices the art of the outsider. He is the figure of fun who is secretly the wisest of all, the stumbling fool who is actually more dextrous than anyone, the grown-up man who has never lost his child-like sense of wonder and imagination. A clown, he says, is a "person who, on entering the room, brings joy and love for life". Although it has its origins in the late 1980s, Snowshow has been reinventing itself ever since. It never stops changing. Slava has a profound belief in the importance of spontaneity and goes to great lengths to ensure he and his company stay creative. It means giving them holidays and encouraging them to develop outside interests – and it also means shaking things up every night. "This is a science and I am expert in it," he says. "You always have to find a new creative challenge for the team to keep the stage activity interesting. My performers know which part they are going to perform only half an hour before the show. All the time, we change direction, change the style and the mood of the show. That's very important to keep it interesting and fresh." Slava's Snow Show, Edinburgh Festival Theatre, 3–6 December.